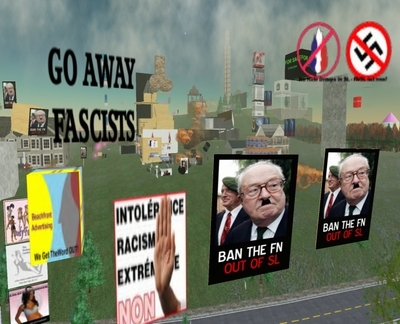 The first night I arrived at the protest against the Second Life headquarters of Front National, the far right French political party of Jean-Marie Le Pen, it was ringed on all sides by protesters with signs to wave and statements to distribute. By the second night I came (this was late last week), the conflict had become more literal, for many Residents had armed themselves. Multi-colored explosions and constant gunfire shredded the air of Porcupine, a shopping island which FN had inexplicably picked for the site of their virtual world HQ, in December. Du browst gerade in den ubik Weblog-Archiven. Klaus Wowereit rettet seine Nachbarn vor dem sicheren Feuertod. A Charlie Brown Christmas as performed by the cast of Scrubs.